Early Half Dimes: The Five Cent coin of the United States 1792-1837. Ask anyone "What is a five-cent US coin called? ", and more than likely, the reply you'll get is "a Nickel". Of course, that's the correct answer, but this hasn't always been the case. Prior to the introduction of the first US nickel in 1866, the five-cent role was filled in the early years of the United States by a small silver coin called the "Half Dime". 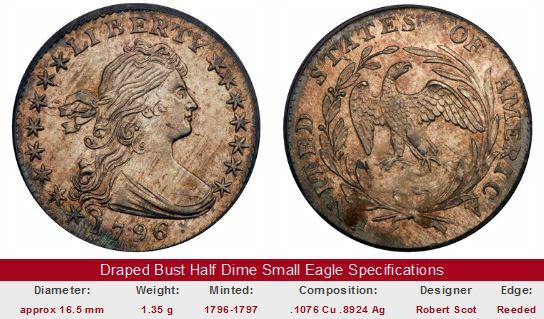 In fact, the first United States coin minted under the Constitution in appreciable quantities was the 1792 Half Disme (the "s" in "Disme" was later dropped). Although only a pattern coin, 1500 of the 1792 Half Dismes were minted, many of which reached general circulation. 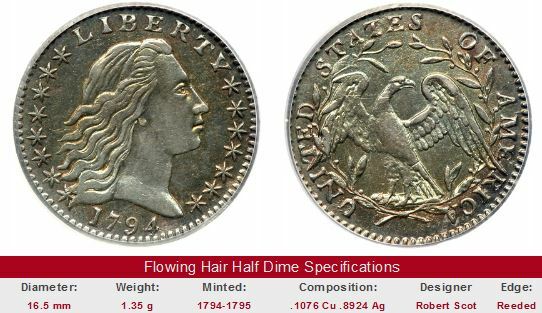 The first regular strike half dimes were dated 1794, featuring a Flowing Hair Liberty (shown directly below) on the obverse and a puny eagle on the reverse. Within a couple of years, the Draped Bust design was ushered in for all US silver coins. For Half Dimes, this style lasted until 1805 (large eagle reverse adopted in 1800), when production of the five-cent denomination paused. In 1829, Half Dime minting resumed with the Capped Bust type, which lasted until 1837. The Capped Bust type was the last of what is known in American numismatics as "Early Half Dimes". 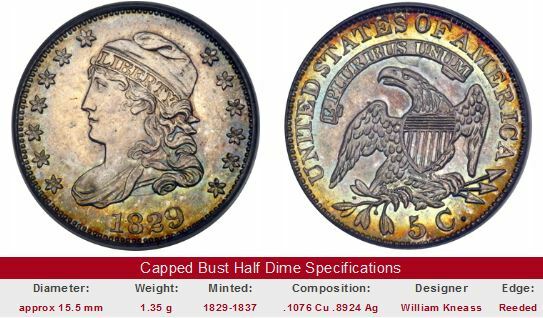 There are several key dates in the Early Half Dimes that are viewed with great awe by collectors. The 1792 pattern coin, of course, is historically significant and quite valuable. The 1802 is a legendary treasure, and commands about the highest price of all US half dimes. Genuine examples of these two half dimes probably won't be found on eBay, unless they're being listed by a major auction house as part of a highly publicized sale. The city of Philadelphia was plagued by yellow fever epidemics throughout much of the 1790s. 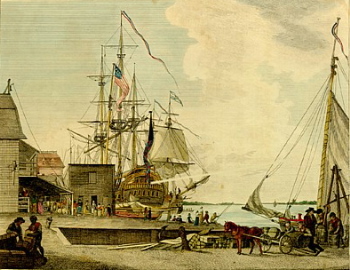 Dr. Benjamin Rush, a signer of the Declaration of Independence, erroneously linked the outbreak to rotting coffee dumped at the Arch Street wharf, shown above. The Mint was forced to close its doors during the summer and fall of 1797-99, as only 7000 Philadelphians remained in the city at the height of the epidemic. Many numismatists agree yellow fever is a reason why no half dimes were coined in 1798-1799. The cause of yellow fever remained a mystery until 1900, when U.S. Army doctor Walter Reed proved the disease was carried by mosquitoes. 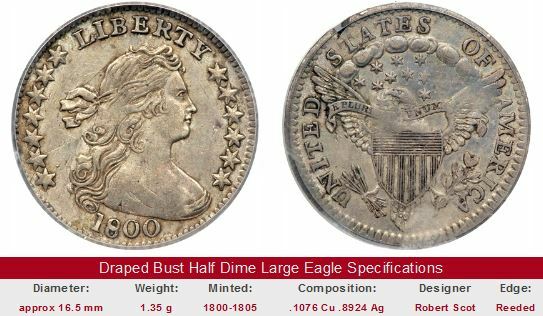 Still, just about any of the Early Half Dimes, excluding the Capped Bust type, are of keen interest to collectors. None of them are considered common dates. Obtain any of them in the best condition you can afford, and you should enjoy steady price appreciation over time, as collectors compete for your artifacts from the first years of the United States. Don't buy unless they've been certified by PCGS, NGC, ANACS, or ICG, or are being sold by a reputable dealer. Key date Early Half Dimes are offered for sale below as eBay auction coins. The left hand side of each "Sales Box" is value trend data over a very long period of time for an Early Half Dime coin type example in G-4 condition. The percent annual increase is computed for comparative purposes. The coin pictured for sale in the right hand side is not necessarily the same coin as that represented in the value trend analysis on left hand side, but is of the same type.